U Using sophisticated computer models, the team found that puddles exist and may possibly support microbes. The poles of Mars are areas where the temperature is lower and the pressure is higher. Therefore, there may be a likelihood that more oxygen will be added to the water. And the poles of the Red Planet are the most likely place to find clues to life. 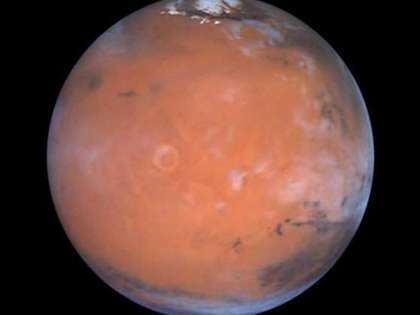 "If there are brines on Mars, then oxygen would have no choice but to infiltrate them," co-author of the study Woody Fischer, a geobiologist at Caltech, said in a press release. "The oxygen would make it anywhere," Smithsonian reported. "We were absolutely stunned," said lead author Vlada Stamenković of NASA's Jet Propulsion Laboratory. "I went back to recalculate everything like five different times to make sure it was a real thing," according to the Smithsonian report. On the contrary, it must be noted that the atmosphere of Mars is about 160 times thinner than that of Earth and usually contains carbon dioxide. The availability of liquid water on Mars remains uncertain. "Oxygen is a key element in determining the habitability of an environment, but it is relatively rare on Mars," Woody Fischer said in an official statement. "Nobody ever thought that dissolved oxygen levels needed for aerobic respiration could theoretically exist on Mars," said Vlada Stamenković of NASA.